Sociological perspectives and medical models This report was awarded a distinction grade. It outlines the main sociological perspectives on health and ill health, including Functionalism and Marxism. BTEC Level 3 Health and Social Care. Unit 4 task 1. Development through the life stages. This is an essay that meets all necessary criteria to achieve P1, M1 and D1, for unit 4 - Development through the life stages. The person that is used to build the person's life span is Wallis Simpson. This work was marked by teacher and it meets all the criteria perfectly. Hope it helps! BTEC Level 3 Health and Social Care. Unit 2 task 2. It is a report written in a way to meet all necessary criteria for student to achieve P4, M2 and D1 for Unit 2 - Equality Diversity and Rights in Health and Social Care. You will see that the work is structured with introduction - main body, which will cover: P4. Explain how national initiatives promote anti-discriminatory practice; M2. Assess the influence of recent national policy initiative promoting anti-discriminatory practice; D1. Evaluate the success of recent initiative in promoting anti-discriminatory practice. - conclusion and reference list. This report was marked by teacher and helped me to achieve all the marks. BTEC Level 3 Health and Social Care. Unit 4 task 2. P2, P3 This is a written peace of work that covers necessary criteria to meet P2 (Explain the potential effects of five different life factors, on the development of individual) and P3 (Explain the influences of two predictable and two unpredictable major life events on the development of the individual.) for unit 4. This work was marked by teacher and it got the marks. Hope it helps! Psychological perspectives and approaches to health This assignment covers Unit 8 of Health and Social Care BTEC Level 3. It was awarded a distinction and covers the main psychological perspectives, including Pavlov\'s dogs classical conditioning and Skinner\'s rats and Freud\'s psychodynamic approach. 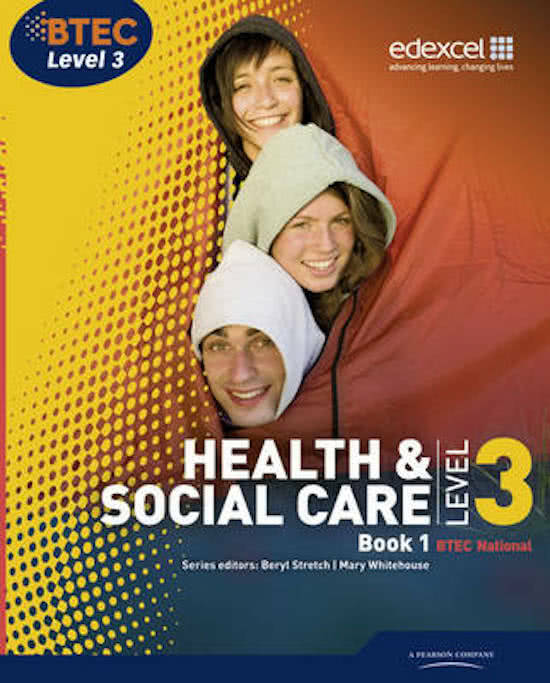 BTEC Level 3 Health and Social Care. Unit 4 task 3. P4, M2, D2. This is an essay written for unit 4 task 3. It is covering criteria for P4, M2 and D2. This work was marked by teacher and achieved all criteria perfectly. Hope it helps! Unit 3 P4, M3 and D2 P4- Explain possible priorities and responses when dealing with two particular incidents or emergencies in a health and social care setting/M3- Discuss health, safety or security concerns arising from a specific incident or emergency in a health or social care setting/D2- Justify responses to a particular incident or emergency in a health or social care setting. Sur cette page, tu trouveras des résumés, des guides de révision et bien plus de livres de révision BTEC Level 3 National Health and Social Care: Student Book 1, écrits par Neil Moonie & Carolyn Aldworth. Les résumés sont écrits par les étudiants eux- mêmes, ce qui te donne les meilleurs renseignements sur ce qui est important de réviser dans ce livre. Les sujets tels que Sociological perspectives on health and ill health & Sociological models of health and ill health seront traités.